One of the most sought after contemporary violinists in today’s dynamic atmosphere of composers, creators, and improvisors, Jennifer Choi is involved in engaging musical projects and is a pioneer in performances that stretch the limits of conventional violin. She has premiered numerous solo and chamber works to critical acclaim by the likes of John Zorn, Randall Woolf, Elliott Sharp, and most recently in concertos by Wadada Leo Smith, Orlando Garcia, and Daniel Felsenfeld. As a collaborator, Jennifer has been a member of the Either/Or Ensemble since 2007, when the premiere performances of composers like Helmut Lachenmann, Keeril Makan, and Anna Thorvaldsdottir were given, and frequently performs in Anti-Depressant duo with pianist Kathleen Supové, performing challenging and accessible works by American composers. In the 2011-2012 season, she toured with the string quartet ETHEL, and in previous seasons played and recorded with the Sirius Quartet, Fireworks Ensemble, and Classical Jam at venues like Barge Music, Caramoor, Strathmore, Metropolitan Museum of Art, Roulette, LPR, and the Stone. 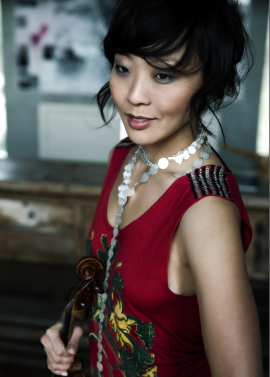 Jennifer’s debut solo album, Violectrica - works for violin and electronics, was featured on WQXR, as well as her latest album on the New Focus label, African Math, with works by Martin Scherzinger. She can be heard on over a dozen albums on TZADIK, and in Target, featuring works by Keeril Makan on the Starkland label. In 2000, the same year that she gave her debut recital at Carnegie’s Weill Recital Hall, Jennifer began improvising professionally, and subsequently toured some of the world’s largest jazz festivals as violinist of the Susie Ibarra Trio. She also performed with Vijay Iyer, Ikue Mori, Erik Friedlander, Craig Taborn, and the late Derek Bailey, among others.